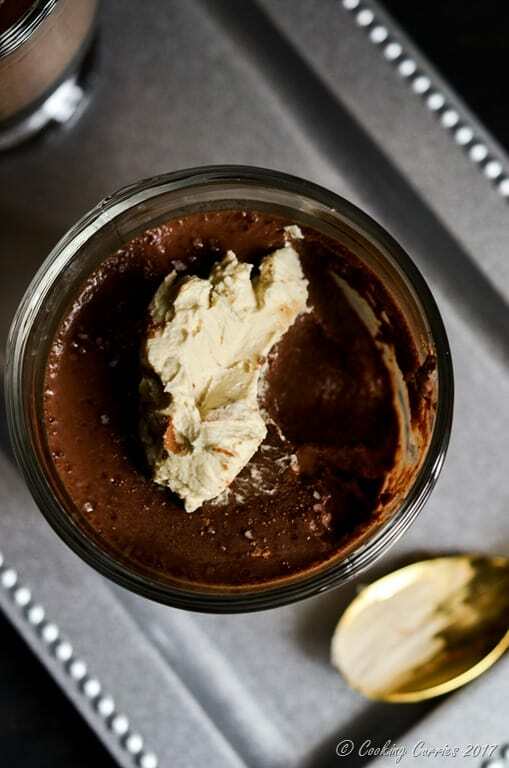 Creamy and decadent Panna Cotta with Dark Chocolate and topped with some whipped mascarpone cheese with Kahlua. 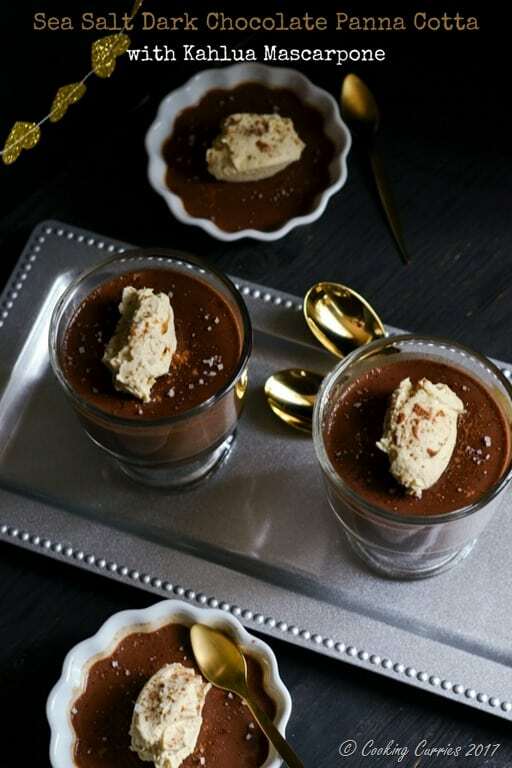 The sea salt in it enhances the chocolate flavor and elevates the dessert to a completely new level. I find that developing savory recipe and making them is a lot lot easier than making desserts or baking. With savory dishes, the only thing you need to keep in mind is the salt-heat-sourness balance and how the different star ingredients compliment each other. Sometimes a touch of something sweet or umami balances things out perfectly. There is no need to think about the texture, whether something will set or not, if the cake is moist or not etc. Texture and consistency matters a lot more with sweet dishes than savory ones and those are a little harder to control than the other elements of a good dish. The last time made a panna cotta was this really delicious vanilla bean and ginger panna cotta. There was a little bit of learning involved as I developed the recipe for that and a little bit of trial and error too. The first time I made it, it did not set at all and I was back on the computer learning about the different ingredients and what helps the gelatin set and what inhibits it. Apparently ginger was one of the things that inhibits the setting property of gelatin and so I had to use a little more gelatin the second time around to make it set well. 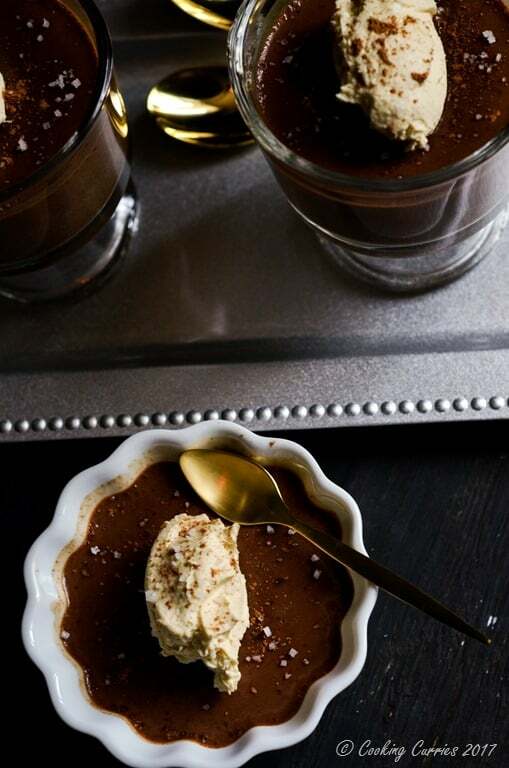 This sea salt dark chocolate panna cotta, on the other hand, was fairly simple as there were no inhibitors in this recipe and I just had to follow the basic panna cotta ratio of 1 tbsp. gelatin to 2 cups of liquid. I used cocoa powder and dark chocolate chunks to give a layer of chocolate flavor to the dessert and the sea salt elevates the chocolate-y taste of it. 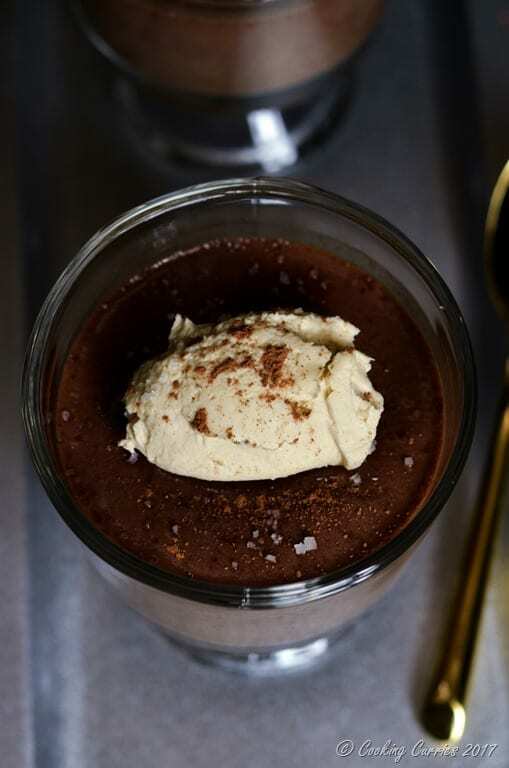 I just whipped up some mascarpone with some Kahlua in it and topped off the panna cotta with it, to give it a little bit of an adult version vibe to it to serve to your loved one on Valentine’s day as a special dessert! I hope you enjoy this dessert as much as we did! Heat the cream and milk in a sauce pan, add the sugar, melt it and add the cocoa powder and dark chocolate chunks and let it all melt and mix in well. Lower the heat and let it be. Mix the chocolate extract into this. Now mix in the gelatin to the 1/2cup cold milk and let it bloom. It will turn into a loose pasty mixture. Whip the mascarpone cheese with the kahlua in it to become airy and to loosen it up a little. Top each ramekin / serving of the panna cotta with a little of the whipped mascarpone and sprinkle some sea salt over it. Dust with some cocoa powder (optional) and serve! Pure decadence! I am a huge fan of mascarpone in desserts and love how you have paired it with the Kahlua. This is one the reasons I love networking with food bloggers because you get a variety of recipes. And this dessert is just full of pure goodness! I love savory desserts as well. Oh and the addition of mascarpone and Kahlua take this dessert over the top. Yummy! It’s a nice set of flavours this chocolate dessert. I believe every good dessert contain a touch of salt or savoury. Looks greats! I should make this. I have a box of cream in my refrigerator and it needs to be used before it gets all bad. What a divine dessert. Love chocolate and salt. This is the perfect way to end a meal. Would be awesome to make for company. Kahlua mascarpone?!? I’ll take two to go please. Those sounds absolutely divine!! ??? ?you bet! And thank you! Oh heavens this sounds AMAZING! I’ve been on a sensible diet since New Year’s (fitness goals) but I think I might just have to break that for this recipe! Oh my…. swoon! Mm, the dark chocolate and sea salt sounds amazing, and I bet the kahlua mascarpone compliments it well. A really beautiful dessert. These sound so yummy and they look perfect. I’m not a fan of kahlua but I would definitely try it in this recipe! The flavors are making my mouth water! Thank you April. You can use Irish cream instead or just skip it too. It’s delicious without that too ? Oh my, what a delicious treat! 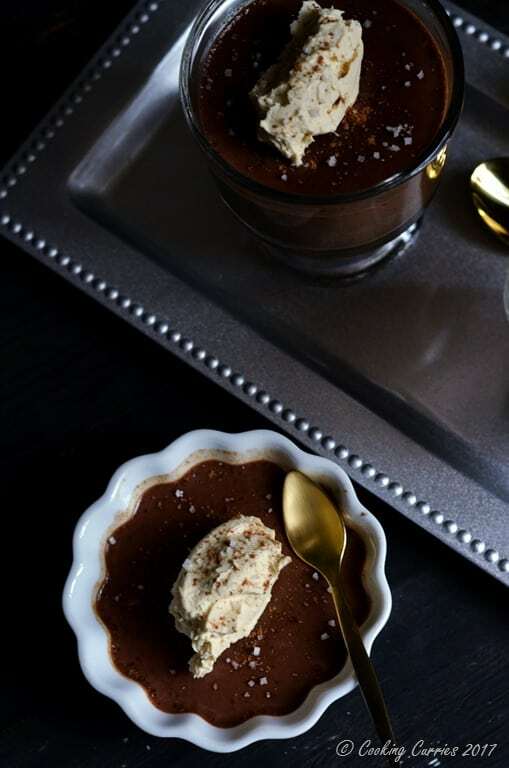 Sea salt and chocolate is one of my favourite flavour combinations and I love the idea of a kahlua mascarpone topping.